Free Angela! 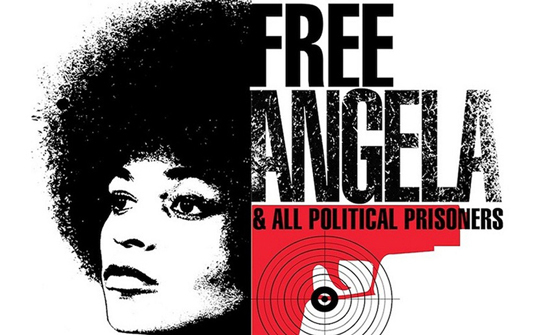 is a brilliant documentary that captures the sensational murder and kidnapping trial of Black Communist and UCLA Professor Angela Davis in the early 1970's. It provides extraordinary archival footage, interviews with Davis, all four of her trial lawyers and the activists who co-led a massive international movement for her freedom. Davis was deeply involved in a movement to help save the lives of three Black prisoners know as the Soledad Brothers, and was also active in the Black Panther Party and the anti-Vietnam war movement. Davis was indicted as a co-conspirator by a Marin County Grand Jury and when "unavailable" was placed on the FBI's Ten most Wanted list. This was the result of an attempt by prisoners from San Quentin to escape during a court case in Marin County on August 7th, 1970. The judge, two of the prisoners, and their young would-be liberator were killed by San Quentin prison guards; the prosecuting attorney and the other escaping prisoner were critically wounded. Condemned in sensational media coverage, then President Richard Nixon and then California Governor Ronald Reagan denounced Davis as a "dangerous terrorist." Davis was in fact the target of government revenge as a symbol of the radical fervor of those times. The film tells a complicated story in a comprehensible, powerful way that continues to reverberated in our own time. Special Features: There will a Q & A with Co-Chief Council for the Davis defense, Howard Moore and Professor Bettina Aptheker following the screening.